However, birch woodland has mainly persisted (in the U.K.) where conditions are harsh and limit the growth of other species. In the past, over-grazing and burning may have limited / reduced birch woods. 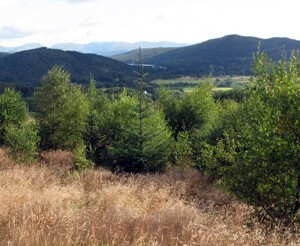 Upland birch wood is now to be found in Scotland (and some parts of Northern Britain– though scarce – may be seen on the upper slopes of Borrowdale and Yewbarrow, Cumbria), and is generally associated with infertile and poorly drained soils. Silver Birch (Betula pendula) is commonly found in the Highland - sometimes as a result of selective felling for timber), whilst Downy Birch (Betula pubescens) is more likely to be found in colder and wetter places (with Rowan and Willow). 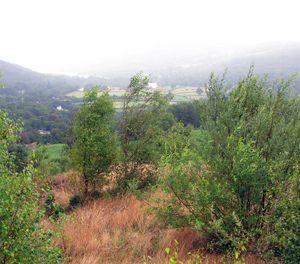 Upland birch wood may be used for grazing and shelter of livestock, and some felling for firewood. In the North West of the Highlands, where it is both windy and wet – the trees rarely reach a height of ten metres. In the North east of the Highland, both species may be found (often in pure stands i.e. 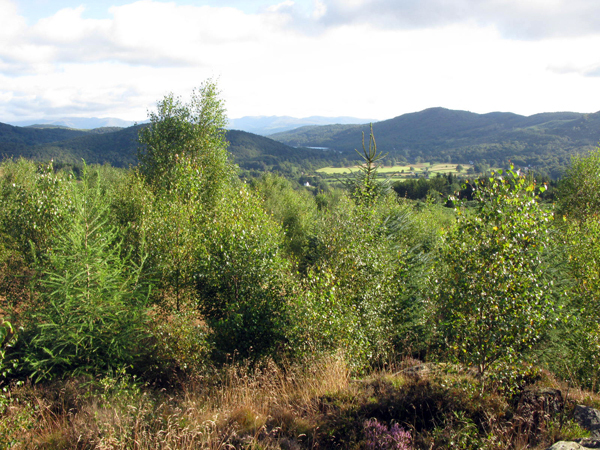 the only tree species present); but birch may also be found with Juniper and Scots Pine, ‘hinting’ of a past association with Caledonian Forest (that was once much more widespread). Such woodland can vary from a small isolated copse of trees to a more extensive and established woodland – with a herb layer that may include species such as Sheep’s Sorrel and Tormentil. The wood of birch rots quickly and supports a diverse invertebrate fauna and fungal flora; birch woodland may provide an important habitat / niches for birds. Upland birch wood on the ‘Atlantic Fringe’ may have rich communities of lichens and bryophytes (mosses and liverworts). Dwarf Birch (Betula nana) is found in a somewhat more ‘extreme’ environment – a plant of arctic conditions. Birch trees have separate male and female flowers (that is, they are monoecious). The flowers appear at the same time as the new leaves in the spring. The male flowers are drooping catkins, about 3 cm long. The pollen can be a problem to hay fever sufferers. Birch trees release their pollen between March and May, and hay fever sufferers are likely to experience the highest levels and the worst of their symptoms during April. 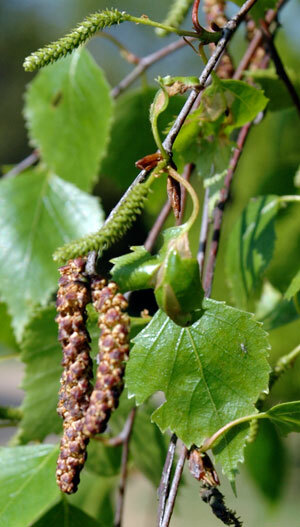 Birch pollen counts tend to be high on dry, warm days, when there is a light breeze (sufferers can find information about the current pollen levels here). Female flowers are upright and between 1 and 2cm tall. The flowers are wind pollinated. The pollinated female flowers elongate and form hanging catkins. These will form hundreds of tiny seeds, which are dispersed on the wind. Birch has had a number of uses – from firewood, to tool making, various herbal remedies and the sap used to create a fermented drink. Birch was until fairly recently used in production of turned broom handles in Kent. Dried pieces of birch bark are excellent for lighting a campfire. Even better than birch bark for fire lighting are tight bundles of the thinnest twigs from the end of branches, often found on the woodland floor. Natures firelighters.